BLAINE, KY. — Early Friday afternoon, during a D.I.C.E. 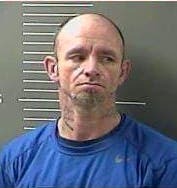 patrol (Drug Interdiction Corporation Enforcement program), Lawrence County Constable Daniel Castle observed an individual known to have active warrants at Kimber’s market located in the Blaine community. 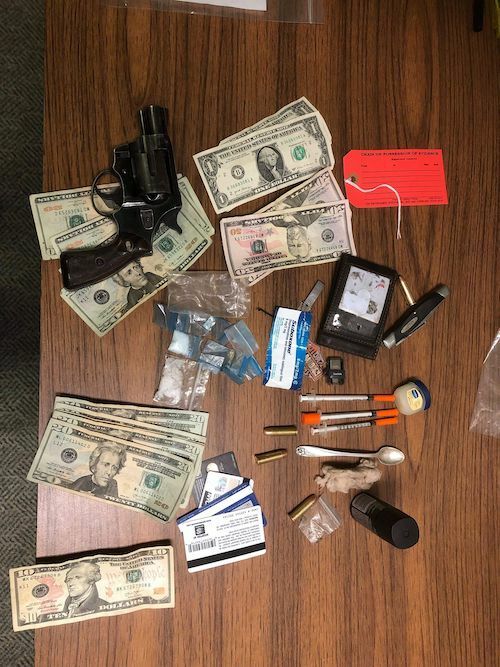 During his investigation, Constable Castle discovered one of the individuals was a felon in possession of a loaded concealed firearm, a sizable quantity of methamphetamine, a digital scale, marijuana, prescription pills, multiple syringes and various other drug paraphernalia commonly used in drug trafficking. 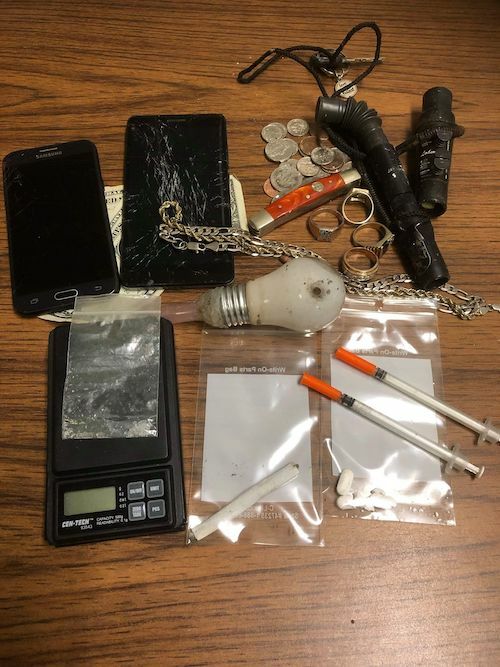 Paul Jenkins, Eric Osborne and Stella Mollett were arrested by Constable Daniel Castle and charged with trafficking in a controlled substance and possession of drug paraphernalia. Additionally, Jenkins was charged with being a convicted felon in possession of a handgun and carrying a concealed deadly weapon. The trio were lodged in the Big Sandy Regional Detention Center. 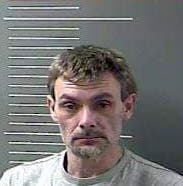 Assisting was Sheriff Chuck Jackson of the Lawrence County Sheriff’s office. The D.I.C.E. program consists of the Louisa Police Department, the Lawrence County Sheriff’s office, and the Lawrence County Constable Association. This case is still under investigation by D.I.C.E. Constable Daniel Castle, left, was assisted in the arrest by Sheriff Chuck Jackson as part of the new D.I.C.E. program started this month to better make use of police manpower throughout Lawrence County, Jackson said. 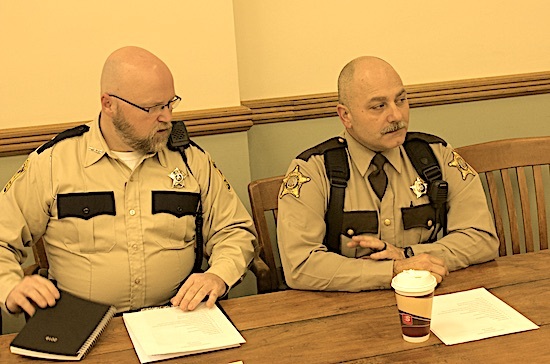 In the past, Constables have not been used extensively by sheriffs for policing. Are your costables required to have the same training as the rest of law enforcement? If not could be putting the public, other law enforcement and themselves in jeopardy. Not be smart, just a guestion I didn’t know the answer too. constable have no authority except to hold u there till the proper law enforcement comes. If they are given the same power as a police officer without proper training then people will get hurt. I am happy for the crack down on the drug problem in our area but with the proper police officers not a paper serving cop wanna be. Here is another fine example of Jackson “assisting”. Just like with the police department bust. Needs to get his guys and himself out and doing the busts and quit riding coat tails. Probably never going to happen because that would require paperwork and effort. Daniel Castle is the Sheriff of Blaine! Seriously though, I’ve never known of a constable in LC doing as much as he has done. He should consider a run for sheriff some day. We could discuss this on Topix2. It recently replaced Topix which had become a cesspool of hatred.